Project Perfect Mod :: View topic - Invasion Confirmed featured in French Magazine(s)! Invasion Confirmed featured in French Magazine(s)! 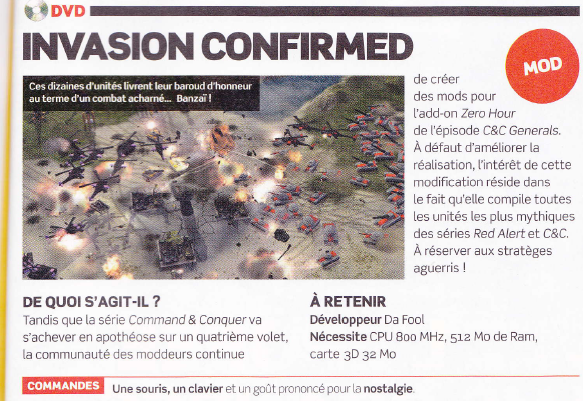 Posted: Sun Feb 21, 2010 9:23 pm Post subject: Invasion Confirmed featured in French Magazine(s)! I just go a hold of 2 french magazines which featured Invasion Confirmed in their download disks. The magazines are from the company Canal Jeux and the magazines are Joystick and PC Jeux. PC Jeux had a small article about Invasion Confirmed pictured below. I am really excited about this as this is pretty much the height of my modding career. I want to thank every one at Canal Jeux for publishing this and every one else who has helped IC become what it is. Update from the Administrator: The link above no longer represents this Canal Jeux. Besides that, we are receiving some pressure to cut it off anyway, because Google is not indexing an old version of the link of this site (ppmsite.com/forum) and, therefore, the link above was considered to be toxic. Note: Google do index our current url (ppmforums.com). Amazing. Good work pays off in the end indeed. Great work! This kind of stuff doesn't happen everyday. Impressive! going new heights is always good. Well congratulations to the IC team! Who knew your little project could become featured so much from BCPT to now in magazines! That's a very good achievement! Congratulations!